When the ball is 6-10 feet off the green and on a good lie, the chip is pretty easy. If the ball is at that distance but in rough, it’s still an easy shot, but you have to know what you’re doing. The first thing is to find out how much grass is beneath the ball. Stick your forefinger into the grass near the ball, being careful not to disturb it. By touching the tip of your finger on the ground, you should be able estimate how far the bottom of the ball is off the ground; that is, by how much the ball is suspended in the grass. There are three possibilities. 1. The ball is resting on top of the grass. This happens if the grass is thick or has strong blades. For this shot, use your 8-iron and hit the ball with your putting stroke. This makes sure you lift the ball off the grass and get it running when it hits the green. 2. The ball is suspended in the middle of the grass. Here, use a sand wedge of 55 or 56 degrees. Hit the shot with your standard chipping stroke. Make sure you follow through. The thickness of the grass will grab the club, so your follow-through will be short, but don’t let the grass win a complete victory. The finger test tells you how deeply into the grass you must swing the club. 3. The ball is all the way down on the ground. Take out your 60-degree wedge. Play the ball back a bit in your stance. The object here is use a steep swing and thump the ground underneath the ball with the sole of the club. Forget about hitting the ball. Just thump the ground in that spot and the ball will pop out. There’s a lot of wrist action in this stroke, not much arm action. The grass will limit the follow-through. Practice these shots before you try them on the course. The November 2015 Golf Digest has a cover article by Tony Finau with the same title as this post. The article reveals his opinion that the fastest way to get better is to get good with your driver and your putter. The driver part won’t do you any good, though if you can’t hit the green with your 7-iron. If you can’t hit the green with your 7-iron, you won’t hit many fairways with your driver. Might as well leave it home. Change your swing so you can hit the green with your seven-iron, say, eight out of ten times. Then you can haul out a driver. As for putting, the ones to practice are the 30-footers and the 3-footers. Learn to get the ball close to the hole from a distance. Not doing that is the major cause of three-putt greens. Then learn to get the ball in the hole from close in. Missing the short putts is the other cause. Those two things sound obvious, but surprisingly they’re not. 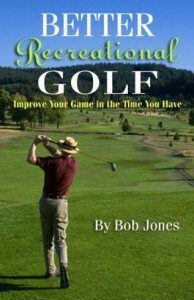 The way to get better at golf is to be real good on the basics. The 7-iron and putting are the basics. Go get ’em. When you go to the driving range, go there to work on something in particular. Don’t go just to hit golf balls. The next time you go, try an exercise to learn what I believe to be the most valuable swing technique you can have: your hands lead the clubhead into the ball. This video shows you what I mean, and gives you a drill to learn the rudiments of the motion. Assuming you’ve learned that, here is a practical exercise for teaching yourself how to install that movement throughout your bag. Go to the range with just two clubs, your driver and your 8-iron. Warm up, then hit two or three balls with your 8-iron. The point is to feel the hands leading the clubhead into impact. 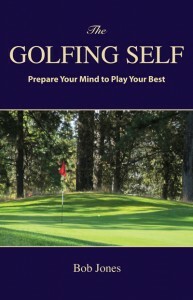 Feel that your hands are dragging the clubhead through the ball. I use the word drag advisedly, as it is not quite the right word, but you will get the feeling right if you regard the dragging as a movment that flows smoothly and with speed as a natural continuation of the swing movements that precede it. Now take your your driver and hit one (1) ball with it, using the same swing feeling that you had with your 8-iron. Maybe the swing will be bigger, but don’t put any more “hit” into it, or be concerned at all about how far the ball goes. The point here is to learn a swing detail with this club: the hands lead the clubhead into impact. Put your driver down and hit another 8-iron shot, using an easy swing in which the hands lead the clubhead. Switch to your driver again and copy that 8-iron swing, with the same feeling. One shot. Keep switching back and forth, one shot with each club, each swing being a copy of the other, each swing focusing solely on the hands leading the clubhead through impact. By the middle of the bucket, you should be hitting brilliant shots with each club, seemingly without effort. That will do two things for you. First, it will provide you with convincing evidence that this approach is right. Second, it will provide you with repetitions of a new habit in replace of an old one. As well, it would not hurt at all to use this exercise as the centerpiece of your pre-round warm-up. Here’s one more way of looking at it. Literally. 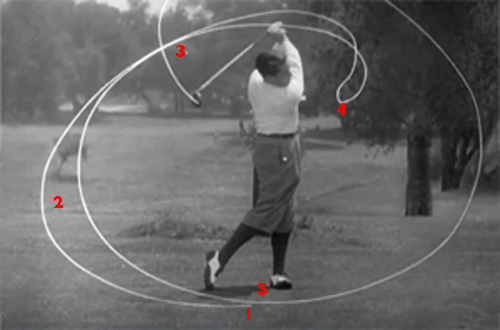 This is Bobby Jones’s swing, with a tracer on the clubhead. The points of the swing rhythm are marked. 1 is the instant of takeaway. 2, 3, and 4 are the backswing, 4 being the end of it. 5 is impact. Again, it looks like you would have to rush to get back to the ball in one count over the same distance it took you three counts in the backswing. For almost 35 years, I have studied and taught the martial art of Aikido with Ki. Part of the advanced training involves a wooden sword called a bokken. We use the sword to learn how to apply the principles of the art while holding an object (although there is lot to be said about what that statement really means). What applies to the bokken applies to a golf club. Of the several principles for using the sword is always to move the sword from its tip. Instead of moving the sword from our hands, we think all the way out to the tip, and move that. The reasons why are too involved to go into here, but that is the principle that I want to talk about in relation to a golf club. 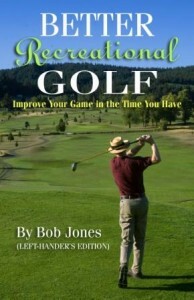 We can refine that statement by saying not the entire clubhead but the tip of the golf club, which is on the clubhead. That tip is the sole of the clubhead. A few week ago I posted an essay on how to stop chunking chip shots. The idea was not to think, “Hit the ball,” but, “Brush the grass.” Well, what is it you brush the grass with? The sole of the clubhead. The tip. Now the tip of a sword is small and pointy. The tip (sole) of a golf club is broad, long, and flat. But it is a tip in its own way. You always read, correctly, to hit the ball first and the ground second. You hit the ball with the clubface. What do you hit the ground with? Not the leading edge of the sole, as might seem obvious, but the entire sole. You control the sword by controlling the tip. It’s the same with a golf club. When the sole goes to the right place, the rest of the club will too. After all, they’re attached! They key to consistent ball striking is to hit the ball on the center of the clubface every time. We control that in large by delivering the sole of the club to the ground in the same way every time. You might spend some time working with chips, short pitches, longer pitches, and moving up to a full swing with this thought in mind — swing the sole of the club to a consistent point with each swing. Everything else will fall into place.